Looks like he didn't like you taking his photo! Watch out for that scythe! He's complaining that the French don't take him seriously, like we do in the US. Happy Halloween, Eric, and don't take any rubber candy. BV, aren't you ashamed? Taking some time off to visit PDP at your office! Nice skeleton! I guess Halloween could be seen as a "Hallmark Holiday" but we in America really get into it. Especially the kids. Happy Holloween, though it's not Halloween for us yet! Seeing as how it's the celebration of death for many cultures either 31 Oct or 1 Nov, here's something scary: St. Louis (where I live) is THE MOST DANGEROUS city in the USA. So anyways, since it's the start of the most wonderful time of the year, Happy olidays to everyone, for everything that you celebrate!!! Halloween is fun for all, especially the kids, big and small. Adam Gopnik, an American who lived in Paris for several years with his family, wrote about it. In his book, Paris to the Moon, he has a chapter on Halloween as experienced in Paris. Seems to me that the pagan celebration is spreading throughout the globe. Not bad, it's harmless! But perhaps Marie would not agree with me!! So many fond memories of halloween! I don't celebrate it anymore but only stopped dressing up and going to parties about 5 years ago....I have friends that still love it and wait impatiently Oct 31 each year! Soosha, I read that today! It's probably centered around one specific area though right? Happy Halloween for all those that celebrate! When I was a little girl in Wisconsin, my mom made me a fabulous witch's costume for Halloween. It scared me so that I had nightmares about it for years. I guess that's why grownups here love Halloween. It reminds them of scary times when you could go home and everything would be all right. And the candy was good, too. And the bigget grossing movie of this weekend was Saw III. Hollywood knows a good holiday when they see one! I live in Asia, halloween is not really a big events over here. I was in U.K Newcastle 8 years a go when a group of kids come over my house for halloween. Nice experience. 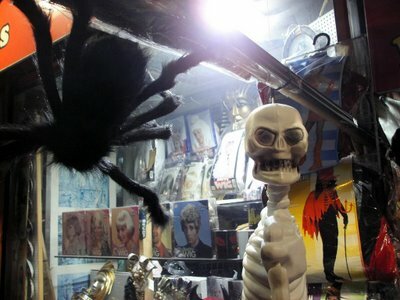 In Chile Halloween is a commercial holiday, brought to our country by business people a few years ago to earn more money. Very few actually know what Halloween means, but kids really enjoy it. in Washington DC, all of the college kids get to go trick-or-treating on EMBASSY ROW which is the street (AKA Massachusetts Avenue) that is lined by embassies. i love halloween...when i have the time to think of a costume! I can't believe how big Haloween has gotten here in Canada. There are people in our neighbourhood who decorate as much for it as they do for Christmas. Lawn displays and pumpkin lights and big blow up thingys on their lawns from Walmart. People do their entire yards like graveyards and put fake cobwebs in their windows. They just go nuts around here! Because of the sbow this year I feel sorry for the little ones who will be out with their costumes on either under or over their snow jackets! The popularity of shopping malls holding safe Haloween for kids indoors (where they can trick or treat at the stores) is growing too. This is the first year my kids are officially too old too go out. I'm kinda melancholy about it! Mostly because it means less candy for me to mooch! Ha ha! p.s....cant wait for theme day! It seems that the novelty has worn off now here in France. A few years ago, it was becoming a big thing with stores being decorated, etc., but now I've hardly seen a single sign. Not even a pumpkin! I remember being in Brittany with a friend with his nieces and nephews all dressing up as ghosts and goblins. No Mickey Mouse's, Disney characters or Spice Girls to be found. It was like stepping back in time to when Halloween was really home made costumes and scary! soosha_q - I thought of you when I saw the article St. Louis named most dangerous U.S. city. What a shame, it's such a boooootiful city too. Ohhhh, how could I let Halloween go by without a couple of these? What did one ghost say to the other ghost? "Do you believe in people?" Michael: Ha ha :)...cute! Reminds me of when I was in elementary school and my mom made me a WICKED Princess Leah costume! I think I wore it around the house until Christmas. Best costume you ever had? Anyone? I am not sure if this will translate good but when I was in Houston once for Haloween my wife disguised as a brick and I was a brick layer. Our american friends helpped us with the disguise and everyone laughed. we had painted a wall; I was a solitary brick standing very close to them: another brick *and* the wall. ("All in all it's just another brick in the wall.") We did win the prize! My sister thanks you for the greeting, Eric. She loves visiting Paris as do I. "trick or treat" est l'expression de la situation non? Halloween in Japan definitely comes up short. so sad... it's my favorite holiday. it will have to be celebrated at home in front of a bad horror movie. A brick layer (hee hee), Another brick and the wall....I think I sense another theme here :). Eric, did you know that Toussaint is on November 1st BECAUSE OF Halloween? The Catholic Church under the Roman Empire decided to establish Toussaint to coopt the pagan celebration that people would not stop observing, the Celtic day of the dead at the end of October(Halloween means "la veille de toussaint"). The only country where Halloween continued to be celebrated was Ireland, which was never under the Romans. The Irish brought it to America a hundred years ago and because it is a wonderful holiday, the Americans took it up. But it is still a big holiday in Ireland, too. Asterix and Obelix would have celebrated Halloween too-- the Gauls were Celts. I tried to comment hours ago but my server died after a long script. I was bemoaning the over commercialization of Halloween which now almost equals that of Christmas and surpasses Easter, here in the U.S. Yesterday I noticed several of the big stores were dismantling H. displays. 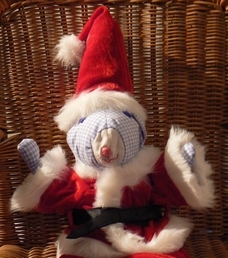 Christmas stuff was out at the beginning of Oct.
Did not receive your email. Please try again: Jwp3937@yahoo.com You may have been one of my students. I taught in Hollywood areas for many years. Eric and Fellow Commenters, sorry, I don't have Michael's email address. Hallowe'en didn't use to be important in Québec, but the influence from English-speaking North America has rubbed off and it is celebrated more. However, not too many kids go around begging where I live in the middle of a large city. I fondly remember Halloween in my youth and as a young adult being trick or treated by the kids. However, with all the dangers children face today Halloween has become more of an adult celebration in the US. We have had very few children knock on our door over the last ten+ years. Now Churches, shopping malls, and even civic organizations create safe spaces for the kids to trick or treat. We have however been invited to a lot more custom parties on Halloween. I think this thing about "safe places" needs explained for those people who do not know about the "dangers" of trick-or-treating. I can see the kinds around in the streets. They will probably soon ring my bell. I found this link that is pretty good: The History Of Halloween! I think this is funny and wanted to share! I hope this link works (I copied this from an email I received). It's a halloween e card. Hi Eric, great post for Halloween! Micheal, I think Denton means "dangers" such as poison or razor blades in candy or pedophiles. "Safe places" are carnivals or special events put on by churches, shopping malls, schools, etc. Hope that helps! I love Halloween and hope that it doesn't someday get to a point where people feel it is too "dangerous" to participate. Oh! And don't forget to click on the "bloopers"....that's funny too! sedulia - thanks for your explanation. I'm all for anything pagan ;-) but don't like the way it is co-opted by retailers. Here in Australia, we tend to eat pumpkins rather than carve them! Australia had lots of Irish sent here; wonder why Halloween didn't transfer - unless it was suppressed by the English who were the ruling class? A great big "boo" to all! Michael, those jokes...the only one I remember is - why don't witches have babies? Because their husbands have halloweeners. Like the good witch said, "Come sit for a spell." Happy Halloween! Michael, I ust loooooove it when people think of me in connection with danger! :p anyways guys, St. Louis mayor Francis Slay is calling the report a crock of s**t because it came out the day after we won the World Series and the #2 most dangerous city was named as Detroit. I tend to agree, the company that put out that survey is just trying to cash in on the World Series. Like any big city we have our share of danger, but I doubt we're the worst. If you have a moment, please visit my trips Gabon site. Enjoyed the blog - holiday movie soundtrack. A new site has been launched with plenty of bargain holidays to choose from. Bookmark http://www.bargainplace.co.uk not just for bargain holidays but for flights and transport to and from airports plus travel insurance deals and holiday clothes. I just saw a very good website about franquicia site. It has a lot of information on franquicia related stuff. I'm Glad i ran across this blog.Added www.parisdailyphoto.com to my bookmark! Am I seing double, or is it just the wine?